Well, let me tell you about the power of positive thinking or making a wish come true. We arrived in Austin to find an unusual set of circumstances that allowed me to take the time off, put enough money in the bank for Mary to pay bills for September, and with the rest I started packing and thinking of Happy Camp…. August 26th rolled around and I was headed for California. Yes!! After a good trip I arrived in Happy Camp at 10:30 p.m. on the 28th (Monday). Tuesday morning I gathered up supplies for my much modified 5-inch dredge, then went to Morgan Point to set up camp. Putting the dredge in the water and getting it set up was interesting, to say the least. I had extended the frame for more stability and added another motor, (an eight horsepower and a five) so it took some time to get things balanced and the sluice set. The next two days I sampled and fine tuned the dredge so I was getting very good recovery and losing very little gold. I then had to change to another jet tube—I felt I was not getting the suction I should. The replacement jet tube had more power with only one motor (the 8hp B&S) than the first with both going! The dredge could really move some gravel after that. I found out quickly that I wasn’t getting much gold here so I decided to move to another claim. I decided to go back to the claim I’d worked in July to try a little further downriver from the place I stopped working. 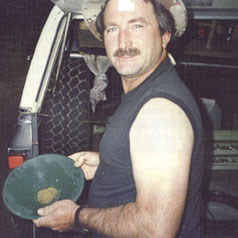 Dave McCracken had told me back in July that I might drop back downriver from the pocket I was in and work the top couple of feet of gravel to see how much gold was in it. I didn’t have the time then but felt it was something that should be done. Now, Dave knows what he is doing in the gold dredging business and knows the rivers around the area, so he can be relied on to be correct if he suggests something you could do. On the way to the claim I stopped at the Savage Rapids claim to help handle some maintenance a group of New 49er’s was taking care of. With the large group that was there it didn’t take very long to get the work done. While doing this I met a very nice fellow from Arizona, Philip, and we formed a partnership to work the claim on up the river. I really love to camp out in the woods, out away from almost everyone, where you can listen to the insects, the birds and other wildlife. When Philip arrived we got his gear set up, then floated down through the claim to see where to put the dredge, using face masks and snorkles to watch the bottom. I noticed the inside bend of that part of the claim had a lot of large boulders, the current was much slower, and the spaces between were hard packed with gravel. The area looked like the typical gold trap to me! This definitely looked like the place to try a sample. Going back to the truck we decided it was too late in the afternoon to set up the dredge but we made ready so we wouldn’t lose time in the morning. 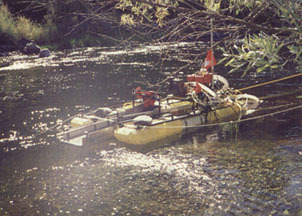 Next morning we setup the dredge and got it ready to float downstream. Did I mention to take it through a nasty set of rapids? Well, we floated it near the bad part, then stopped to assess the situation. I showed Philip where I needed him to be to help catch me and the dredge after we came through the rapids. He agreed to do that with no reservations after I explained how I was going to guide it from behind all the way through them. He said he doubted my sanity but figured I knew what I was doing (little did he know). After he was in position I eased the dredge out into the current (where it promptly turned and went the wrong direction around a large rock). This got interesting real fast when it went in between two large boulders, then got hung up on a third that was just underwater. Here I was, trying to hang on so I would not be swept away from the dredge and to get this thing off the rocks before it flipped over (you can think fast when you need to). In a few seconds I figured where to push or pull, then it was sliding on over that rock and a wild ride was beginning. Whoa, Nellie!!! I got through there and Philip pulled the dredge and me onto the gravel bar. Whew! This sure was a lot more fun and exciting than winching around and over this area. I figured we’d have to make a few sample holes before finding the pay-streak, so the first place we tried was where the large boulders stopped and mostly smaller ones started. This, it turned out, was the right place the first time. After dredging for just over an hour we checked the sluice. Man, did our eyes bug out… Wow!! We had hit a good pay-streak on the first try. I could see gold all under the screen and in the mat. Oh boy! Screening this down quickly I could see we had a lot of gold so I set this aside to weigh separately. Later we found out it was about 2.5 pennyweight. A real good start. Feeling good, we went back in and dredged until the gas was gone. As we were dredging, we noticed flakes of gold as they were uncovered and went up the hose. We developed a system of working. this area when we discovered that the gold was indeed in the top two or three feet of gravel. We’d go down till we hit a hard packed layer, work an area about ten feet wide from midstream at an angle up to the bank, then go back midstream and do it again, throwing the cobbles into the area we’d dredged. I noticed the gold was still coming out of the gravel and off the hard-pack. It sure looked good underwater. When I saw it I showed Philip, and that got us encouraged and going again. We had some very, very nice gold on this cleanup and added it to the rest. The next day we needed supplies, so into town we went to sell the gold. What we had for approximately seven hours of dredging was eighteen pennyweight of gold. (I measure dredging in hours underwater rather than days). Not bad at all. On one dive we were dredging around a large rock (about 200 lbs) when we noticed that a lot of gold was in the area around it. We dredged a hole about three feet deep in front of the rock, spread it out some, then realized it was time to refuel the dredge. After taking care of that, back down we went to clean out that area. I forgot about the rock and was standing in the hole about thigh deep leaning on another large rock embedded in the side of this hole, dredging more of the hole out when I felt a grating vibration… I jumped straight up and pushed away from the suction hose which, thankfully stayed in the hole. As it was, the rock still hit my ankle very hard when it slid into the hole and into the other large rock. The suction hose kept them from pinning my foot in the hole. It took another three minutes to move the rock off the hose. After the close call Philip signaled for us to go to the surface, but I wouldn’t go. What we did was stay down and keep working. My ankle was hurting badly and I couldn’t put much pressure on it, but I kept right on going. I just placed my ankle against the rock where it hurt, then kept right on dredging until the pain quit. When the gas was getting low we went up for the day. Later at camp we looked at my ankle and it had a very dark bruise about the size of a half dollar, but I could walk very well on it. A couple of days went by and the gold kept coming up real nice and stayed about the same amount or better so we kept going straight upstream. One day I tried to get a little further out in the middle of the river. This produced less gold so we continued to work the slope of the riverbed where the big rocks were. Now on Saturday afternoons the New 49er’s put on a potluck dinner and all are invited. This is a real neat affair where everyone gets to sit around, eat, and tell their stories — you know, just really have a lot of fun. Philip and I really looked forward to Saturday night potlucks in Happy Camp even if we did have to drive thirty miles to get there. Then one morning Philip bent over to tie his shoe laces and when he raised up he pulled his back out. For the next day or so he tried to recover, but when his back didn’t get better he decided to head back home. I enjoyed his company while he was there and missed him after he left. I got my hands on a wetsuit heater that fits on the exhaust of a dredge engine and installed it. This heats water fed through a hose that fits inside the wetsuit. Oh, wow, it sure felt good to have warm water flowing while I was in that cold water every day. This sure helped to be able to stay in the water longer each day as I could barely stay in for one tank of gas before. I now was working alone and had to really hustle to move a lot of gravel per day but I just did it and was soon to the point where I was moving an area about fifteen feet wide, about ten feet long, and two to three feet deep every four to five hours. That was moving a lot of material! This was also paying off very well. I was averaging half an ounce of gold every four or five working hours. For the next eight or ten days the area stayed productive and when I worked I found gold. The water was turning colder and I wouldn’t work every day. Two days later at the Saturday night pot luck dinner my nose started to bleed (I never get nosebleeds, ever). I realized I had a bad sinus infection. I took it easy Sunday, but on Monday I was still getting nose bleeds so I decided that it was time to head for Austin. As this trip came to a close I started to look forward to next summer. I traded some of my gold for the pieces to put together a six -inch dredge. In a few hours I had most of what I needed, so I left Happy Camp with something to keep me busy over the winter. I reflected that I had indeed had a good adventure. I met and got to know some very good, trustworthy people. I’d accomplished what I started out to do — find more gold and have a better time. The total gold for this trip came to just under five ounces. This was three times what I’d done on the last trip. Not bad at all. So, the target for next summer…..you guessed it, no less than three times what I recovered on this trip. Can I do it? You bet I can! I’ll see you on the Klamath.